Die Jovis, 13 Julii, 1648. Grants to Lady Harecourt, &c.
Duke of Buckingham's, &c. Sequestrations. WHEREAS the Petition, referred to the Committee where Sir Thomas Dacres has the Chair, is subscribed by Seven-and-twenty Hands; whereof One Fifteen; viz. 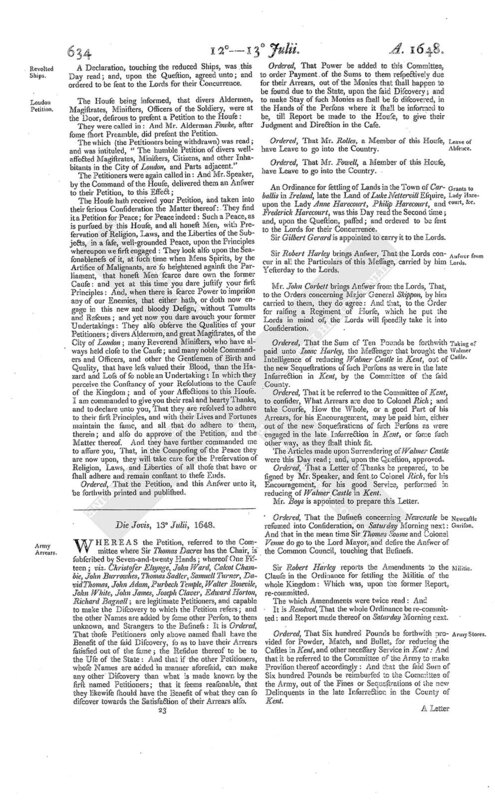 Christofer Elsynge, John Ward, Calcot Chambie, John Burrowhes, Thomas Sadler, Samuell Turner, David Thomas, John Adam, Purbech Temple, Walter Bosevile, John White, John James, Joseph Claver, Edward Horton, Richard Bagnall; are legitimate Petitioners, and capable to make the Discovery to which the Petition refers; and the other Names are added by some other Person, to them unknown, and Strangers to the Business: It is Ordered, That those Petitioners only above named shall have the Benefit of the said Discovery, so as to have their Arrears satisfied out of the same; the Residue thereof to be to the Use of the State: And that if the other Petitioners, whose Names are added in manner aforesaid, can make any other Discovery than what is made known by the first named Petitioners; that it seems reasonable, that they likewise should have the Benefit of what they can so discover towards the Satisfaction of their Arrears also. Ordered, That Power be added to this Committee, to order Payment of the Sums to them respectively due for their Arrears, out of the Monies that shall happen to be found due to the State, upon the said Discovery; and to make Stay of such Monies as shall be so discovered, in the Hands of the Persons where it shall be informed to be, till Report be made to the House, to give their Judgment and Direction in the Case. Ordered, That Mr. Rolles, a Member of this House, have Leave to go into the Country. Ordered, That Mr. Fowell, a Member of this House, have Leave to go into the Country. An Ordinance for settling of Lands in the Town of Carballis in Ireland, late the Land of Luke Nettervill Esquire, upon the Lady Anne Harecourt, Philip Harecourt, and Frederick Harecourt, was this Day read the Second time; and, upon the Question, passed; and ordered to be sent to the Lords for their Concurrence. Sir Gilbert Gerard is appointed to carry it to the Lords. Sir Robert Harley brings Answer, That the Lords concur in all the Particulars of this Message, carried by him Yesterday to the Lords. Mr. John Corbett brings Answer from the Lords, That, to the Orders concerning Major General Skippon, by him carried to them, they do agree: And that, to the Order for raising a Regiment of Horse, which he put the Lords in mind of, the Lords will speedily take it into Consideration. Ordered, That the Sum of Ten Pounds be forthwith paid unto Isaac Harley, the Messenger that brought the Intelligence of reducing Walmer Castle in Kent, out of the new Sequestrations of such Persons as were in the late Insurrection in Kent, by the Committee of the said County. Ordered, That it be referred to the Committee of Kent, to consider, What Arrears are due to Colonel Rich; and take Course, How the Whole, or a good Part of his Arrears, for his Encouragement, may be paid him, either out of the new Sequestrations of such Persons as were engaged in the late Insurrection in Kent, or some such other way, as they shall think fit. The Articles made upon Surrendering of Walmer Castle were this Day read; and, upon the Question, approved. Ordered, That a Letter of Thanks be prepared, to be signed by Mr. Speaker, and sent to Colonel Rich, for his Encouragement, for his good Service, performed in reducing of Walmer Castle in Kent. Mr. Boys is appointed to prepare this Letter. Ordered, That the Business concerning Newcastle be resumed into Consideration, on Saturday Morning next: And that in the mean time Sir Thomas Soame and Colonel Venne do go to the Lord Mayor, and desire the Answer of the Common Council, touching that Business. Sir Robert Harley reports the Amendments to the Clause in the Ordinance for settling the Militia of the whole Kingdom: Which was, upon the former Report, re-committed. It is Resolved, That the whole Ordinance be re-committed: and Report made thereof on Saturday Morning next. Ordered, That Six hundred Pounds be forthwith provided for Powder, Match, and Bullet, for reducing the Castles in Kent, and other necessary Service in Kent: And that it be referred to the Committee of the Army to make Provision thereof accordingly: And that the said Sum of Six hundred Pounds be reimbursed to the Committee of the Army, out of the Fines or Sequestrations of the new Delinquents in the late Insurrection in the County of Kent. A Letter from the Lord Admiral the Earl of Warwick from Holborne, of 12 Julii 1648, was this Day read. Resolved, &c. That Two Members of this House shall be sent with my Lord Admiral, to Sea, according to the Desire of my Lord Admiral's Letter. Resolved, &c. That Mr. Alexander Bence be appointed one of these Members. Resolved, &c. That Colonel Edward Popham be appointed one of these Members. It is further Ordered, That this Letter from the Lord Admiral, of 12 Julii 1648, be referred to the Consideration of the Committee at Derby House. A Letter from the Committee of Essex, of the Eleventh of July 1648, was this Day read. Resolved, &c. That this House doth approve of the Intentions of the Committee of the County of Essex to raise Five hundred Horse and Dragoons, and One thousand Foot, for the Guard and Security of the said County. Resolved, &c. That the Sequestrations of the real and personal Estates of the Delinquents, in the now Insurrection in Essex, shall be employed, by Ordinance of Parliament, to the Maintenance of the Forces raised and to be raised in that County, for the Defence and Safety thereof. Resolved, &c. That the Fines of all Delinquents in Essex, not formerly sequestered, shall be employed to the Maintenance of the said Forces. Resolved, &c. That it be left to the Lord General, to take Course for the Release of Sir Wm. Massam, and the rest of the Gentlemen of Essex, either by Exchange, or otherwise as he shall think fit. Upon the Report from the Committee at Derby House. It is Ordered, That no more Prisoners be brought to London, especially Persons of Quality: And that the Lord Andever be committed, and do continue still a Prisoner at Dover Castle. Resolved, &c. That Colonel Coventry be committed to Windsore Castle. It is further Ordered, That it be further referred to the Committee of Prisoners, from time to time to dispose of such Prisoners as shall be taken, either by Transportation, or otherwise, as they shall think fit, out of London. Ordered, That it be referred to the Committee of the Army, to make Provision of Victuals for the Garison of Wallingford Castle, to the Value of Five hundred Pounds: And that the said Sum of Five hundred Pounds be reimbursed to the Committee of the Army, out of the Receipts at Haberdashers Hall, or some such other Way, as the Committee of the Army shall think fit. Sir Robert Pye carried to the Lords the Order for a Publick Thanksgiving; and the Declaration touching the revolted Ships. Ordered, That the Ordinances for impowering Major General Skippon to inlist Volunteers; and for indemnifying him, and such as do inlist; and for the Committee of the Militia to assist and encourage; be forthwith printed and published. Sir Robert Pye brings Answer from the Lords, That to the Order for a Publick Thanksgiving on Wednesday next; and to the Order for Chester; the Lords do agree: To the rest of the Particulars of the Message, the Lords will send Answer by Messengers of their own. Mr. Wheeler, Tellers for the Noes: 53. Colonel Bossevile, Tellers for the Yea: 42. Resolved, &c. That Mr. Stephens' Report from the Lords, upon the Conference, be first heard To-morrow Morning: And that Mr. Green's Report from the City of London, be heard next after Mr. Stephens's Report, Tomorrow Morning: And that on Saturday Morning the Grand Committee do sit upon the Business of Religion: And Mr. Speaker do forbear to take the Chair that Day. Ordered, That the Ordinance, sent from the Lords, touching the Clerks of the Ordnance be read, the first Business on Monday Morning next. Resolved, &c. That the Sequestrations of the Estates real and personal, and * * * *. 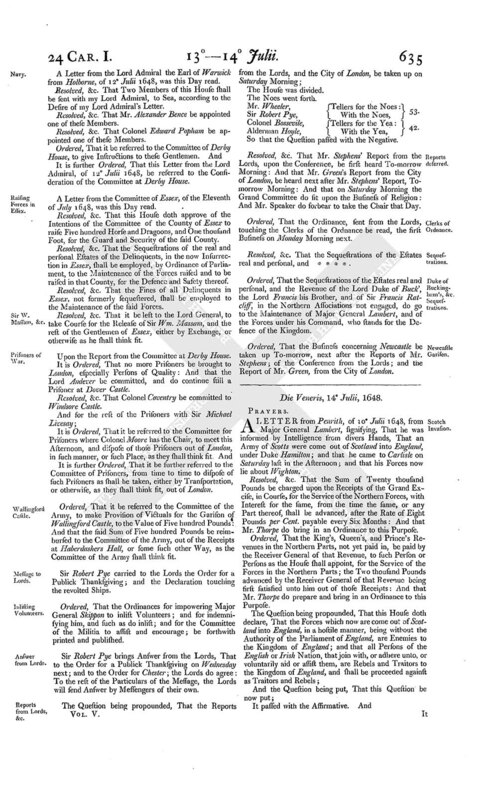 Ordered, That the Sequestrations of the Estates real and personal, and the Revenue of the Lord Duke of Buck', the Lord Francis his Brother, and of Sir Francis Ratcliff, in the Northern Associations not engaged, do go to the Maintenance of Major General Lambert, and of the Forces under his Command, who stands for the Defence of the Kingdom. Ordered, That the Business concerning Newcastle be taken up To-morrow, next after the Reports of Mr. Stephens; of the Conference from the Lords; and the Report of Mr. Green, from the City of London.